Join a unique intercultural experience preparing you for the future classroom! 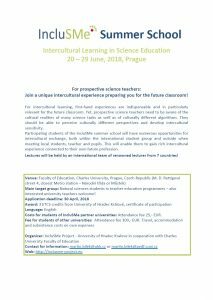 Various lectures and workshops on intercultural learning and science. Students will be equipped with methods for reflecting own intercultural experiences, connecting them to their learning processes linked to natural sciences. Numerous opportunities for intercultural exchange, both within the international student group and outside when meeting local students, teacher and pupils. Preparation for the stay abroad by providing of a module on raising students’ intercultural awareness. 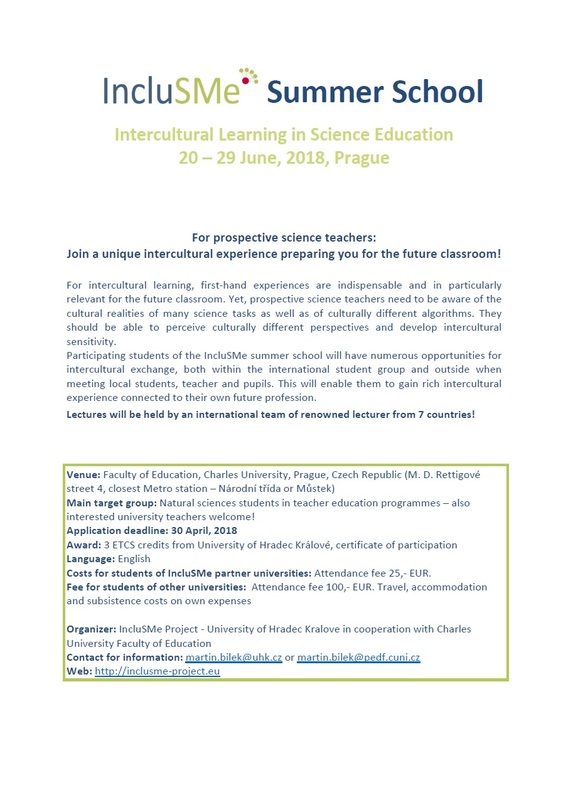 Additional cultural learning programme: for example visit of the Czech National Museum, the Technical Museum, the expositions of the Faculty of Natural Sciences of the Charles University and excursions to schools and non-governmental institutions. For intercultural learning, first-hand experiences are indispensable and in particularly relevant for the future classroom. Yet, prospective science teachers need to be aware of the cultural realities of many science tasks as well as of culturally different algorithms. They should be able to perceive culturally different perspectives and develop intercultural sensitivity. 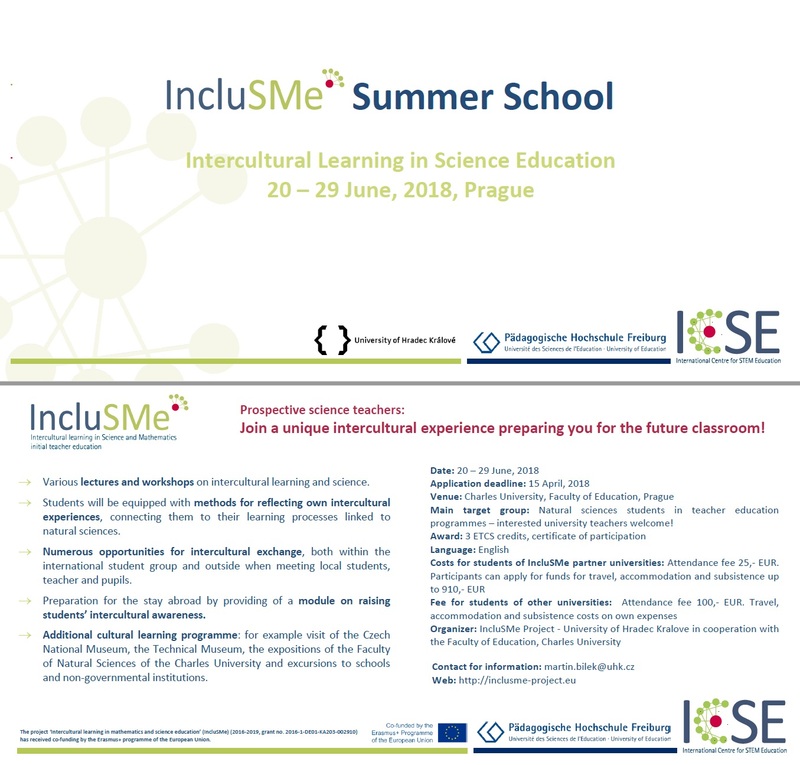 Participating students of the IncluSMe summer school will join different seminars and workshops on intercultural learning in sciences and will have numerous opportunities for intercultural exchange, both within the international student group and outside when meeting local students, teacher and pupils. This will enable them to gain rich intercultural experience connected to their own future profession. 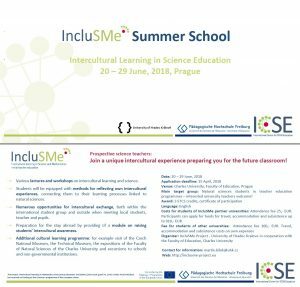 Therefore, IncluSMe offers a summer school in Prague, June, 20th – 29th 2018, with the focus on intercultural learning in natural sciences. Lectures will be held by an international team of renowned lecturer from 7 countries! Intercultural learning combines the acquisition of knowledge (on other cultures, cultural differences, and differing perspectives) with the development of personal competences that affect attitudes, values and opinions. While being an integral part of initial teacher education (ITE) in the humanities, intercultural learning is not included in most maths and science curricula of ITE in Europe. Yet, prospective maths and science teachers need to learn how to cope with language barriers, culturally different conditions and highly varying proficiencies of (immigrant) pupils. Prospective science teachers need to be aware of the cultural realities of many science tasks as well as of culturally different algorithms. They should be able to perceive culturally different perspectives and develop intercultural sensitivity. For details on the modules and activities as well a detailed schedule, please see our booklet. Main target group: Natural sciences students in teacher education programmes – interested university teachers welcome! Costs for students of IncluSMe partner universities: Attendance fee 25,- EUR. Participants can apply for funds for travel, accommodation and subsistence at their university. Fee for students of other universities: Attendance fee 100,- EUR (travel, accommodation and subsistence costs on own expenses).